California has been fertile ground for country music since the 1920s, nurturing a multitude of talents from Gene Autry to Glen Campbell, Rose Maddox to Barbara Mandrell, Buck Owens to Merle Haggard. In this affectionate homage to California's place in country music's history, Gerald Haslam surveys the Golden State's contributions to what is today the most popular music in America. At the same time he illuminates the lives of the white, working-class men and women who migrated to California from the Dust Bowl, the Hoovervilles, and all the other locales where they had been turned out, shut down, or otherwise told to move on. Haslam's roots go back to Oildale, in California's central valley, where he first discovered the passion for country music that infuses Workin' Man Blues. 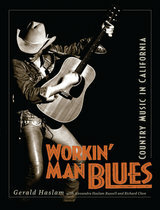 As he traces the Hollywood singing cowboys, Bakersfield honky-tonks, western-swing dance halls, "hillbilly" radio shows, and crossover styles from blues and folk music that also have California roots, he shows how country music offered a kind of cultural comfort to its listeners, whether they were oil field roustabouts or hash slingers. Haslam analyzes the effects on country music of population shifts, wartime prosperity, the changes in gender roles, music industry economics, and television. He also challenges the assumption that Nashville has always been country music's hometown and Grand Ole Opry its principal venue. The soul of traditional country remains romantically rural, southern, and white, he says, but it is also the anthem of the underdog, which may explain why California plays so vital a part in its heritage: California is where people reinvent themselves, just as country music has reinvented itself since the first Dust Bowl migrants arrived, bringing their songs and heartaches with them. Gerald Haslam is the author of numerous books, both fiction and nonfiction. He wrote the text for The Great Central Valley: California's Heartland (California, 1992), which featured the photography of Stephen Johnson and Robert Dawson. A professor of English at California State University, Sonoma, until his retirement in 1997, he lives in Northern California. Alexandra Haslam Russell is managing editor of Gavin magazine. She and her father coedited the anthology, Where Coyotes Howl and Wind Blows Free: Growing Up in the West (1995). Richard Chon plays fiddle with the Sons of the San Joaquin and for many years was an entertainment writer for the Bakersfield Californian.